In June 2018, Vern Bothwell and I went to the Potholes and Prairies Birding Festival in Carrington, North Dakota. The area around the festival is named Potholes and Prairies because glaciers flattened out the land and created ponds (called potholes). This area is the breeding grounds for many sparrow and duck species. There are also many shorebirds that nest here. We decided to go to the festival because there were several species advertised as being readily seen during the festival field trips that were “life birds” (species seen for the first time in one’s life) for Vern and species I had only seen once or twice (or only in winter plumage). We had a great time at the festival and the birds and guides were outstanding. We would very much recommend this festival! Vern suggested we fly to Duluth, Minnesota and start our trip a few days early to birdwatch in that state before going to North Dakota. In addition to looking for life birds, Vern is trying to see 100 bird species in each state; so, an additional goal was to see 100 species in Minnesota and North Dakota. He went a day early and found a Eurasian Tree Sparrow coming to a feeder in Duluth which was his first lifer of the trip. He picked me up at the airport and, after lunch, we drove up to Sax Zim Bog (a famous birding hotspot, especially in the winter) near Forbes, Minnesota. We got good looks at Sedge Wrens, White-throated Sparrows, Wilson’s Snipes on top of trees, and many other birds. We saw and heard many Empidonax flycatchers as well. The highlight of the day was when Vern saw a male Ring-necked Pheasant with a Sharp-tailed Grouse on top of a dirt mound on the side of the road. We also saw several life butterflies, including Milbert’s Tortoiseshell and White Admiral, for me. Later, we drove to Detroit Lakes, MN. We got in very late because we took a wrong turn but saw a Porcupine on the way there. The next day we went to Tamarac National Wildlife Refuge in northwestern Minnesota, which is an eBird hotspot. We saw lots of Trumpeter Swans, Bald Eagles, and many other species, but the highlight of the morning there was seeing a Gray Wolf. It was the first time either of us had seen one. We thought it was too big for a Coyote and the Refuge Manager confirmed that it was a wolf. 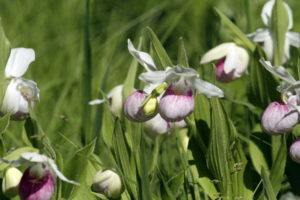 We also saw Showy Lady’s-slippers for the first time. We drove to Carrington, North Dakota where the festival was held. We got up every day about 4:15am to be at the bus by 5am. We were lucky because the night managers set up breakfast for us early each day. The first day (and every day) we went to a prairie. Many of the prairies were grazing areas for cattle; however, there were crops in some areas. We were looking for LeConte’s Sparrows. We saw and heard Savannah Sparrows, but we could not hear the LeConte’s Sparrows that the guides were hearing. They ended up seeing one and getting it in the scopes, but the view wasn’t as good as we had hoped. We spent some of the day looking at ponds, some forest (we saw lots of Brown Thrashers and Cedar Waxwings), and more prairies. The sky was overcast often and there was some rain on many of our outings. On our field trips, we went to different areas each day around Carrington. One day, we watched Sprague’s Pipits flying high and then gliding down while “singing”. We also saw Chestnut-collared Longspurs displaying. In addition, we saw many Icterids—Brown-headed Cowbirds, Red-winged Blackbirds, Western Meadowlarks, and some Baltimore and Orchard Orioles. The most impressive Icteridae though were the Yellow-headed Blackbirds that were everywhere. Since they migrate up and down the central U. S. flyway, we don’t see them very often here in North Carolina, but they are very common in the north central U. S.
The prairies were ablaze with color. Their spring is later than ours, so the flowers were blooming everywhere and the birds (the ones we could hear) were all singing. Turns out that many of the sparrows that we wanted to see have high-pitched, buzzy, insect-like calls, so we could not hear many of them. In addition to seeing LeConte’s, we saw Swamp, Nelson’s, Baird’s, Clay-colored, Song, Grasshopper, Vesper, Lark, and other sparrows. Our photos of the sparrows and some other birds weren’t as sharp as we would have liked. No excuses, but the wind was often blowing on the prairie and sometimes was very gusty. Also, most of the sparrows were skulkers, so they did not allow for clear photos in good light. The birding ended each day around 2pm, so Vern and I would visit other areas, such as Arrowwood National Wildlife Refuge and the ponds around Kensal, suggested by the guides. We found several species of shorebirds on our own, including Marbled Godwits, Willets (western subspecies), Upland Sandpipers, Wilson’s Snipes (often, they were flying around winnowing and often they were very loud), American Avocets, Wilson’s Phalaropes, and other species. 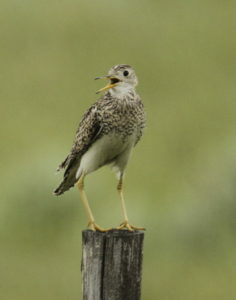 It was fun to see Upland Sandpipers and snipes perched on fence posts. 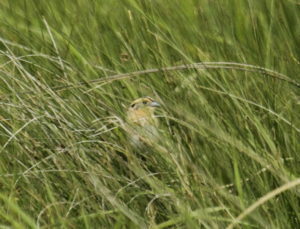 We ended up seeing about 130 species at the festival including several life birds (Baird’s Sparrow) for Vern. I had only seen Baird’s Sparrows and longspurs once each, so it was a treat for me to see those. By the end of the second to the last day of the festival, we had seen pretty much everything we thought we would see, so Vern suggested we leave early. There are some life birds in way southwestern North Dakota, so we decided to head west. Also, we decided we could drive back through South Dakota (and maybe see 100 species in another state). Thus, we packed up, said goodbye, and left Carrington. With our new plan, we drove west to Bowman, ND to look for McCown’s Longspurs (a lifer for Vern) and another bird I had seen only once in Texas in winter plumage. 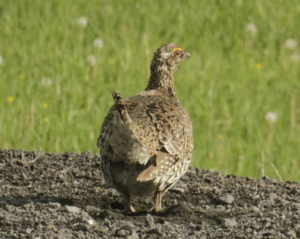 We missed the longspurs, but we did see a Gray Partridge, which was a lifer for Vern. 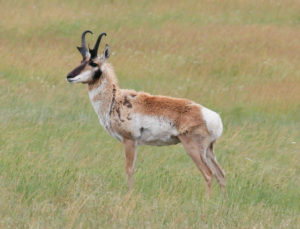 We also saw many Pronghorn Antelope in both North and South Dakota. We then drove south towards the badlands of South Dakota. We had great looks at Upland Sandpipers, a Golden Eagle, and other birds, but it was mostly rainy. We stopped at the old water treatment plant in Belle Fourche and saw some western birds such as a Western Tanagers and Violet-green Swallows. Unfortunately, much of the next day in South Dakota was rainy, so we missed many birds, such as Lewis’s Woodpeckers, Mountain Bluebirds, and others that were being reported in the area. We did go to Custer State Park, south of Rapid City, SD in hopes that the rain would let up, but the weather radar indicated it would not. 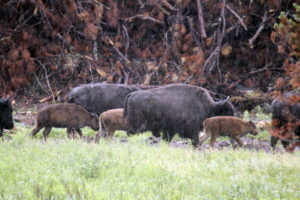 We did see Bison though. We stopped at a hotspot near Bismarck, SD where we saw some common birds, but it started raining there as well, so we left. We ended up seeing about 80 species in South Dakota. The next day we drove back to Minnesota, toward Minneapolis, and stopped at a park just south of the city to look for Henslow’s Sparrows, which was a target bird for both of us. I had only seen it once. We found one and saw it well, but then it started raining. We then headed north through Minneapolis toward Sherburne National Wildlife Refuge near Elk River, MN. We spent most of the rest of the day there. 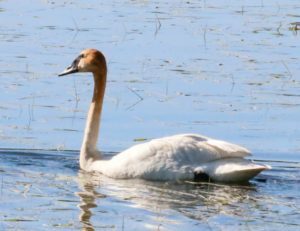 We saw many Trumpeter Swans, including a giant nest with eggs without a female. We also saw a giant Bald Eagle nest with chicks. The highlight was a Virginia Rail that Vern saw, and she was feeding five little black chicks. We returned to Duluth to enjoy Walleye for dinner, but not before seeing a Yellow-rumped Warbler at a park near the city. On the last morning in Minnesota, we saw a Mourning Warbler and a few other species that put our Minnesota list well over 100 species. We ended up putting about 2200 miles on our rental car in eight plus days, but we had a great time (although Vern has probably heard enough of my singing for a life time)! 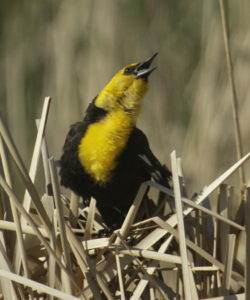 Again, we would heartily recommend the Potholes and Prairies Birding Festival!